American River College horticulture students held a floral sale in the Student Center to help support the horticulture program with plants on sale that consisted of snapdragons, sunflowers, lemon leaves, air plants, carnations and baby’s breath. Many of the arrangements were made by the students within the program. Jamie Decoudreaux, who is not an ARC student, volunteered with the event. “The students have the option to buy their own arrangements and whatever isn’t bought goes up for sale at a fraction of the price you would get them for at a normal retail store,” said Decoudreaux. For every 10 dollar purchase, students had the option of also acquiring a free corsage. ARC students Alfred Kiarie and Timothy Njoroge, both past customers and brothers, returned to buy an arrangement for their mother. If students don’t like what they see one week, they should come back the next. “The variety of plants on sale as well as those selling them will change each week,” said Decoudreaux. 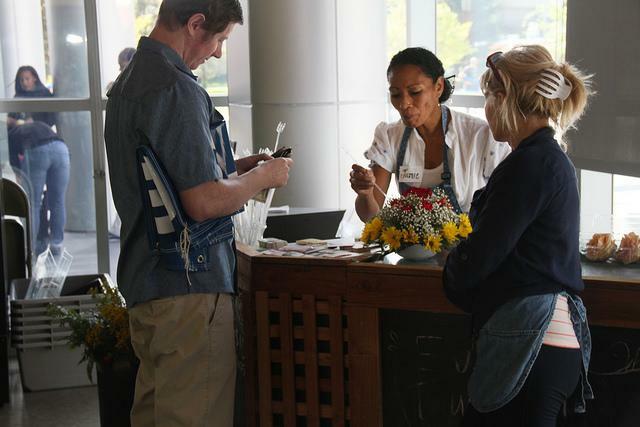 The horticulture department will hold floral sales in the Student Center every Thursday from 10:30 a.m. to 12:30 p.m.
ARC student Vira Zavolokina had never participated in a floral sale event before, but wants to be in many more after this one. Paul Xayphone is a first semester student on the Current. He is majoring in journalism and plans to transfer to Sacramento State. Be the first to comment on "Horticulture department to host floral sale every Thursday"